A Norwegian Cruise Line ship out of Boston ran aground in Bermuda after the vessel experienced a malfunction of its steering system. The company reports indicated that none of the more than 3,700 people on board — 2,675 passengers and 1,062 crew members — were injured. According to the cruise line, "The ship's officers, engineers and an independent dive team have confirmed the structural integrity of the ship." 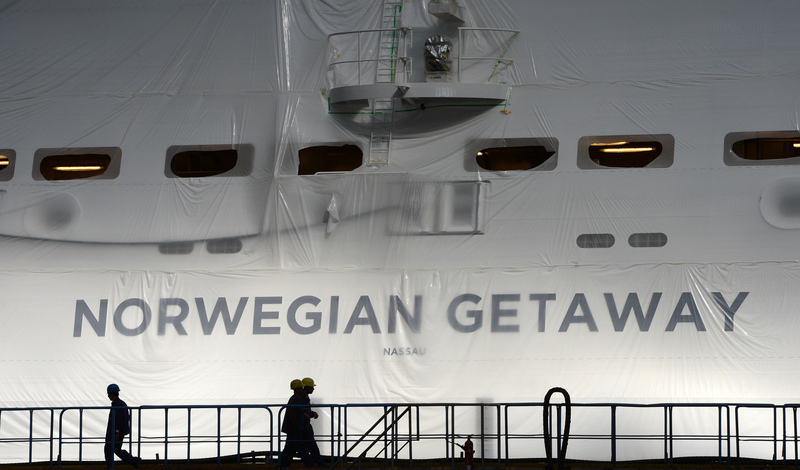 But Tuesday's power outage begs a question: What is Norwegian Cruise Line's safety record like? With so many people aboard, a company like Norwegian, which, according to The Miami Herald, will grow its fleet from 15 to 17 ships by 2019, must keep a tight policy, especially for when it's more than a temporary lights-out. Here's the run-down. According to Norwegian's safety and security procedure outlines, the cruise line operates each of its ships to meet the the Safety of Life at Sea (SOLAS) and the International Safety Management Code maritime standards. And when it comes to navigating the ship, Norwegian seems to play it safe with not one but two crew members in charge of bridge operations, or basically, those who command the thingamabobs and dinglehoppers in the control room. This requirement means there's more than one pair of eyes handling the course of the ship and the thousands of lives on board, which is obviously a great idea. On Sunday, Norwegian experienced a much more serious and isolated incident when a young girl drowned in a pool aboard the Florida-bound Norwegian Gem. A spokeswoman said in a statement, "After extensive efforts, the guest could not be revived. We extend our deepest sympathies to the family during this very difficult time. Norwegian's care team is providing full assistance and support to the family." In 2003, Coast Guard inspectors gave Norwegian's ship S.S. Norway a passing grade, but only 10 days later, the boiler exploded, killing eight crew members and injuring 17 more. The boiler had allegedly been flagged as a problem before, but it was overlooked. Norwegian pleaded guilty to criminal negligence and provided restitution to the victims' families five years later. And in 2005, a 70-foot wave crashed into the 965-foot Norwegian Dawn, disrupting at least 62 cabins of several of its 2,000 passengers, according to U.S. News & World Report. The cruise line said the safety of its passengers "was in no way compromised by this incident." In a 2012 interview with Condé Nast Traveler, Captain Bill Doherty, a former safety manager for Norwegian, claimed that locations that do not always adequately inspect the ships are mostly outside of the United States. The chairman of the Joint Hull Committee, though, said, "The way the shipping industry is regulated can be a bit inconsistent. But to suggest that the job which classification societies are doing on behalf of flag states is inadequate is too much of a generalization." A Fox News writer who worked for several cruise lines — including Norwegian — said that though he himself was trained in fire safety and evacuation procedures, many staff members on cruise ships, such as cooks, room stewards, and singers, are placed in crucial positions in a time of emergency, but they're not adequately prepared. According to Norwegian's website, "All of our crewmembers must successfully complete Standards for Training Certification and Watchkeeping (STCW) training." Despite the seemingly isolated incidents, though, the cruise ship industry has one of the best track records for safety when compared to other travel methods. According to BBC News, from 2005 to 2011, there were only 16 cruise ship deaths out of 100 million passengers.